Latest Dragon Ball Z title is a team melee action game. 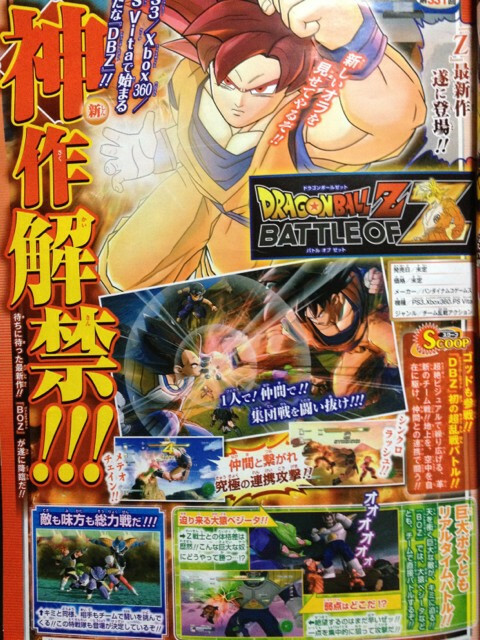 The latest game in Namco Bandai’s Dragon Ball series is Dragon Ball Z: Battle of Z, a team melee action game for PlayStation 3, Xbox 360, and PS Vita, this week’s Jump reveals. The game will feature four-player co-operative play, eight-player Battle Royale, online multiplayer, and huge boss battles. Super Saiyan God will also be playable. Release date and price have not yet been decided. The last Dragon Ball video game to launch was Dragon Ball Z: Ultimate Tenkaichi for PlayStation 3 and Xbox 360 in 2011. It received mixed to negative reception.